Azerbaijan has chosen its beauty for 2014 to represent the country at Miss Universe 2014. Javidan Gurbanova, 24, was declared as the winner of Miss Azerbaijan 2014. Other beauties that were competing for the first place were awarded in several nominations, including I Vice Miss Azerbaijan-2014, II Vice Miss Azerbaijan-2014, Miss Baku-2014, Miss Photo Model Azerbaijan-2014, Miss Charm Azerbaijan-2014, Miss Press Azerbaijan-2014. The first winner and other prizewinners will take part in several international competitions, including "Miss Universe", "Miss Intercontinental", "Miss Image Universe", "Miss Top of the World", "Miss CIS" and "Miss Global International". In addition, the winners received presents from sponsors of the event. They were also given Miss Azerbaijan model certificates. For three months, the contest participants went through casting, qualifying round, and semi-finals to reach the final show. Before the decisive night, contestants were actively working with the renowned choreographer Tatiana Konenko, participating in various promotions and trying different dresses for competition. This year, the organizers held the contest under the slogan "Vote! Choose your Miss Azerbaijan". The official website of the contest (www.missazerbaijan.az) held an online vote in which at least 14,000 took part. Sixteen girls with the highest votes went to the finals, where the second stage of sms-voting started, which last until the final show. Moreover, jury marked the performances with 0 to 100 points. The jury included fashion designer Fahriya Khalafova, chairman of the organizing committee of "Miss Azerbaijan" Anela Orduhanova, representative of Central Asia and the CIS in the beauty contest, CEO of International Beauty Company, Ryskul Namazbekova , organizer of the international beauty contest "Miss / Mrs.Top of the World" Kristine Lindenblate, executive director of "Miss Azerbaijan" Amil Abbasov, chief editor of the official website of the contest Inam Guliyev, and others. The final was subdivided in three rounds. Finalists first presented to the audience in white dresses, and showed wedding dresses and evening dresses from the fashion house of Fakhriya Khalafova. The gala evening continued with a concert of popular artists Ayan Babakishiyeva, Zaur Amiraslanov, Rafael Hajiyev, Eldar Bagirbekov, Jeyhun Bakinskiy, Sofi. National beauty contest "Miss Azerbaijan" has been held in the country annually since 1996. In 2013, the contest winner Aysel Manafova and Oksana Rizaeva for the first time participated in prestigious international competitions the "Miss Universe-2013" and "Miss Top of The World-2013". 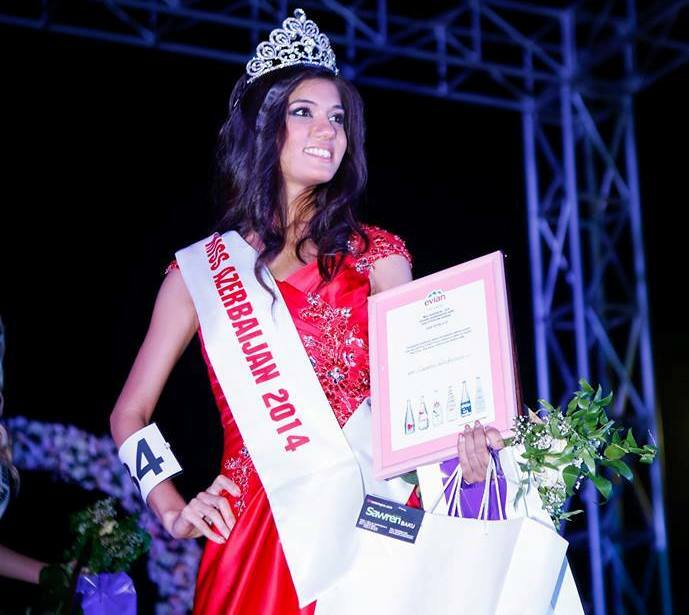 Earlier, Azerbaijan also picked up the winner of Miss Globe Azerbaijan 2014. The professional jury finally decided that Banu Shujai will present Azerbaijan at the 89th international beauty contest, which will be held in Baku on June 21.